The Russian Izvestia newspaper published an article earlier this week, suggesting there is such a plan implying “painful concessions” that Russia is going to offer to the parties after four-day hostilities in the conflict zone in early April that left scores killed and wounded on both sides. Armenian Foreign Ministry spokesman Tigran Balayan already confirmed earlier this month that Russia was intent on reviving its 2011 proposal, known as the Kazan plan, which is largely based on the so-called Madrid proposals of the OSCE Minsk Group and implies an Armenian withdrawal from several districts outside Nagorno-Karabakh proper, the introduction of peacekeepers (likely a Russian or Russian-led contingent) and a referendum on the region’s status. It appears there is no common opinion on the kind of plan within the Armenian leadership. Whereas the Ministry of Foreign Affairs on the whole agrees to accept the plan as a basis for negotiations, the army leadership is throwing all its forces to defend the disputed land that Azerbaijan tried to seize by force in the early April operations. On April 18, Armenian President Serzh Sargsyan went to Karabakh, where he visited military units and awarded soldiers and officers who defended the land with medals. This was widely perceived as a clear message that Sargsyan will not give his consent to the Russian plan if it implies territorial concessions. Through its chief foreign policy spokesman in Armenia, the Armenian Revolutionary Federation (Dashnaktsutyun) party, which is now part of the Armenian government, has also indicated the inadmissibility of territorial concessions. Many experts question the prospect of the Russian plan to succeed, but they say that it is aimed not so much at resolving the conflict as trying to foil the American plan to do so. For over a year now the United States has been offering through his OSCE Minsk Group co-chair its own plan of, if not settling, then at least stabilizing the situation in the conflict zone. Washington suggests placing in the Karabakh conflict zone monitoring mechanisms which will determine the violator of the ceasefire regime. Now the international community supposedly cannot do that. Armenia agrees to such a plan, but Azerbaijan rejects it, because it thinks that this way the current status quo and the boundaries will be strengthened. It is for breaking this status quo that Baku resorted to large-scale military actions earlier this month, but eventually it failed to change the existing boundaries. Russia seems to be offering to change these limits. According to some reports, Moscow offers to Armenians to withdraw their troops from certain areas, but not give them right away to Azerbaijan, but turn into a “security zone” with the deployment of Russian troops. However, even Russian experts admit that Armenia’s consent to such a plan is unrealistic. 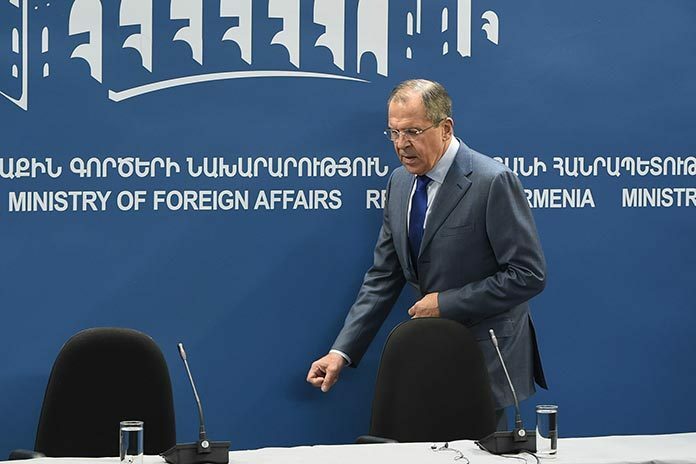 Against this background Lragir.am commentator Hakob Badalyan notes that the “Lavrov plan” is likely to be aimed at scuttling the American proposals.